This is a drawing of the Milky Way looking down from above. The evidence for this picture is provided below. The Sun is just one of 200 billion stars in this typical barred-spiral galaxy that is about 90 000 light years in diameter. A larger and unlabelled version of the above map is available here. Note also that the Orion Arm is not a major spiral arm, but only an enhancement of stars and gas between the Sagittarius and Perseus arms. It should be emphasized that there are almost as many stars between the spiral arms as in the spiral arms. 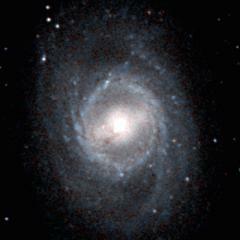 The reason why the arms of spiral galaxies are so prominant is that the brightest stars are found in the spiral arms. Spiral arms are the major regions of star formation in spiral galaxies and this is where most of the major nebulae are found. There are two methods traditionally used to map the spiral structure of our Galaxy. The first method is to study the density of the neutral hydrogen (HI) in the plane of the Galaxy which is enhanced in the spiral arms. This was first attempted by Jan Oort, Frank Kerr, and Gart Westerhout in 1958. They studied the galactic system as a spiral nebula by using radio-telescopes in the Netherlands and Australia. The early version of their map (incomplete on the left side) shows various sections of the spiral arms. The second method is to plot the giant HII regions (bright nebulae of ionised hydrogen) which are usually formed in the spiral arms. This was attempted by Yvonne and Yvon Georgelin in 1976. They studied the spiral structure of our Galaxy determined from H II regions. Their map allowed them to determine where the spiral arms are. For a recent attempt at mapping the Milky Way in neutral hydrogen (although only the outer parts) see The Spiral Structure of the Outer Milky Way in Hydrogen by Levine, Blitz, and Heiles, (2006). For a recent map of the HII regions in the Milky Way see Star-forming complexes and the spiral structure of our Galaxy by Delphine Russeil, (2003). These various maps can be analysed to show the precise spiral form of the Galaxy, see Jacques Vall�e's various studies of the Milky Way ( 1, 2, 3). 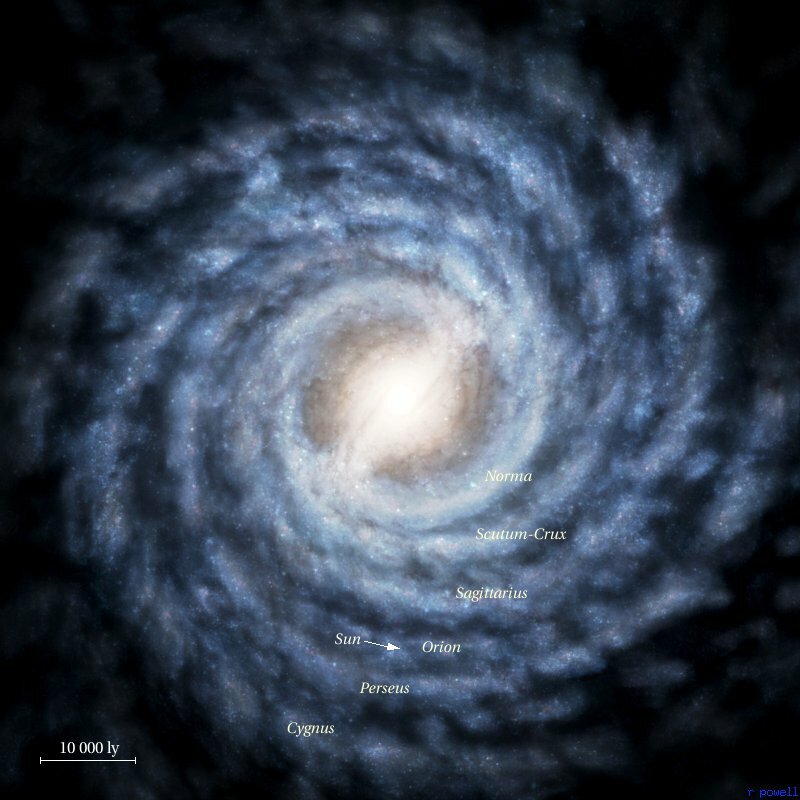 The Milky Way is probably a four-arm logarithmic spiral. If we put all this data together then we get a map like this one below. 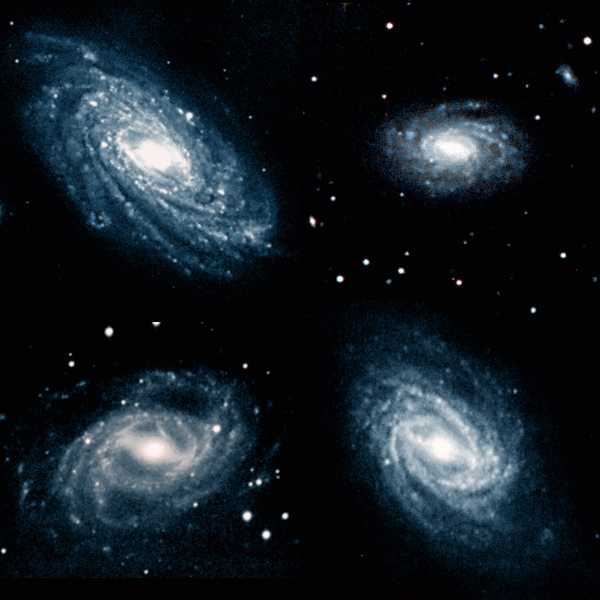 There is not much data available about the far side of the Galaxy but spiral galaxies are usually fairly symmetrical. Features on one side of a galaxy are often repeated on the other side. This is a list of some of the main parameters of the Milky Way. Most of these numbers are approximate. Galaxies do not have precise boundaries - the stars slowly become less plentiful as you move away from the galaxy. Below - four galaxies which look like the Milky Way. NGC 3953 (top left) is 55 million light years away and 95000 light years in diameter. NGC 5970 (top right) is 105 million light years away and 85000 light years in diameter. NGC 7329 (bottom left) is even further at a distance of 140 million light years but it is larger with a diameter of 140000 light years. NGC 7723 (bottom right) is 80 million light years away with a diameter of 90000 light years.